Art Textiles Flow From Studios of Talented Tropical Artists. Making woven art textiles or cosy woollies is hardly an occupation for the warm and steamy Queensland tropical regions. However, surface design on natural fabrics, such as silk, cotton or bamboo, is alive and well. Glowing colours of tropical flowers or brilliant, darting, tropical fish in a deep, turquoise ocean are subjects waiting to be revealed in luxurious silk painted wraps or flowing fashion designs. Such colourful images translate well into lengths of cotton fabric, fantastic for soft furnishings to complement woven light-weight cane furniture, so evocative of relaxed ease. Linda Jackson , renowned for her iconic fashion designs of the eighties in Australia, is well accustomed to designing and supervising the printing of rolls of fabric for such commercial uses. But she also stitches and hand dyes more thoughtful shibori and indigo dyed lengths of cotton for exhibitions. Linda’s studio is at Karnak, near Port Douglas in North Queensland, where she produces designs for tropical fabric and semi-abstract paintings of the area that she has grown to love. 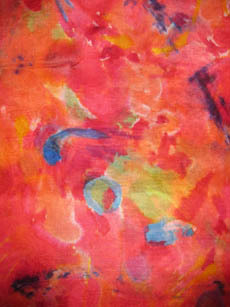 Jill Booth has printed and painted with dyes on fabric for twenty years. 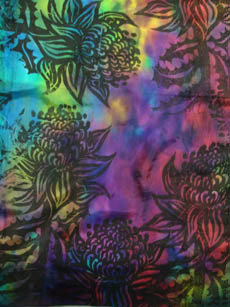 She enjoys painting and printing lengths of fabric , often silk, and dyeing plain coloured fabrics to complement these. These art textiles may be made into clothing or used for interior decorating jobs – or both! 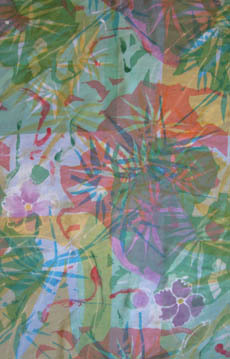 Production work is her “Colours of the Tropics”… hand painted/printed silk scarves…always in demand. See NEW COMPETITION - join in! A silk painter , who has turned her silk paintings into beautiful illustrations for children’s books, is Kim Michelle Toft. A conservationist, she has managed to combine her love of silk painting with her love for children…and the environment. At Kuranda, in the mountains near Cairns, silk painter, Kathryn Edwards creates beautiful, original, casual bridal fashion, just right for a tropical beach, forest or island wedding. Artquest Port Douglas visits the studios of Linda Jackson and Jill Booth on some of its tours. Watch as Linda hand dyes a piece of tropical fabric with natural dyes or see tropical flowers come to life as Jill paints a silk scarf with colour-fast dyes.